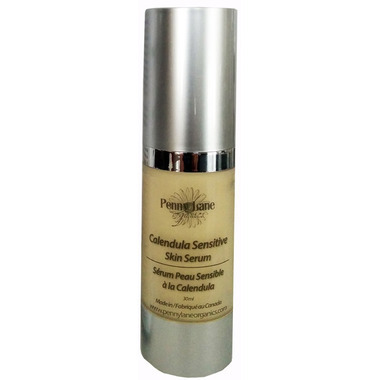 Penny Lane Organics Calendula Sensitive Skin Serum is gentle, cooling, and soothing. When used daily it will make skin look supple, rejuvenated and glowing! A highly concentrated organic Calendula oil helps to brighten dark circles, reduce puffiness, and soften fine lines and wrinkles. It's especially suitable for people with very sensitive skin, skin inflammations, rashes, and other skin disorders. This serum spreads nicely and a little bit goes a long way - only a drop or two is needed to cover the whole face. Directions: Use it on it's own or to complement your day or night cream! Clean your face and neck and tone the skin then dab Calendula Sensitive Skin Serum over wrinkles, dry patches and areas showing signs of aging. Use morning and evening if desired. Made with the best plant based butters and oils this serum is one of the best formulations for eye area as well as any eczema spots. Jojoba oil and Mango butter are great emollients that help combat dry skin which causes wrinkles. Calendula Oil is made with organically grown Calendula flowers from our gardens in Beaver Valley which are infused in organic cold pressed oil. It is carefully observed and tended to for six weeks until the oil gets deep orange colour. After that the flower petals are removed and oil is stored in a cool and dark environment. Ingredients: Certified organic Jojoba Oil (Simmondsia chinensis), Calendula flowers (Calendula officinalis) infused in cert. organic Olive Oil, Water (Aqua), Mango butter (Mangifera indica), Vegetable Glycerin, PseudoCollagen (Yeast Extract), Phytokeratin (Hydrolized Vegetable Protein), Natragem EW (EcoCert certified emulsifying wax for use in natural and organic products), Geogard Ultra (EcoCert certified preservative for use in natural and organic products), Vitamin E (Tocopherol) derived from NON-GMO Soya bean oil. I am using this everday right now. Do use on a damp face - right out of the shower is best and you don't need to use a full pump. Use just a small amount. Only used a small amount of time so far but I love it! Initially fantastic, but found that my skin reacted to something in the ingredients. I can only really use this once a week at the most. I'll use it until it's finished but can't justify repurchasing. I'm a huge fan of Penny Lane Organics and this is my favourite product by them. A little really does go a long way! I like this serum. My skin did not have any kind of negative reaction to it. It is great to use for the spring & summer; however, I would need to apply moisturizer on top in the winter. Great moisturizer for sensitive skin because itâ€™s non-irritating; however, this would be an ideal moisturizer for the summer time because I find that during the winter months, my dry skin still has dry spots even though Iâ€™m using a generous amount of this serum. I too purchased this product on a recommendation from Joyous Health, and I am so glad I did! It is soothing and gives great moisture without making me breakout. There is little to no scent and leaves my skin glowing. I purchased based on a recommendation from Joyous Health. I found it worked nicely in reducing some redness on my cheeks. But I couldn't stand the smell of the serum. It smelled like rotting milk! No one else has ever mentioned the scent but it's the main reason why I wouldn't purchase it again. I love the texture because it's lightweight and non-greasy. I will definitely order again. Wow, this really surpassed my expectations. Silky, soft sensation without any silicones! Totally fragrance-free, no funny chemical smell. And it's a Canadian company! friend recommended it after hearing about it from Joy McCarthy. I love this serum and use it daily. My skin never looked better. Thank you for a fast delivery too. I'm totally amazed by this serum. I watched Joy MacCarthy's video about it and had to try it. Well worth the money. Makes my skin silky smooth and all it takes is a drop or two. This serum is absolutely AMAZING! I saw Joy McCarthy recomending it in her blog video and decided to try it. All my dry patches and red dry spots disappeared in 2 days. I love how little I need to use ( a drop and not more than 2 drops) and that it lasts so long. I recommended it to all my friends. It was highly recommended to me by a friend and I must say this is a real gem. I have extremely sensitive skin and everything always irritated my skin ad made my condition worse. This product is amazing and it takes a tiny bit so it lasts long too. I also saw this product being recommended by Joy MacCarthy on Joyous Health and I must say this cream is fantastic! Smooth and calming for my sensitive skin. A little does go a long way with this product, and the mild scent is very nice. Highly recommend! Absorbs nicely on my skin, does not leave an oily residue. I use it every morning, great base before putting makeup on. I saw this product on Joyous Health - it was highly recommended by Joy MacCarthy so I decided to give it a try. It didn't disappoint! Joy MacCarthy was correct, this serum is absolutely amazing and the best part it only takes a drop to cover my whole face. I use another drop for my neck. It's gentle and soothes my rosacea.